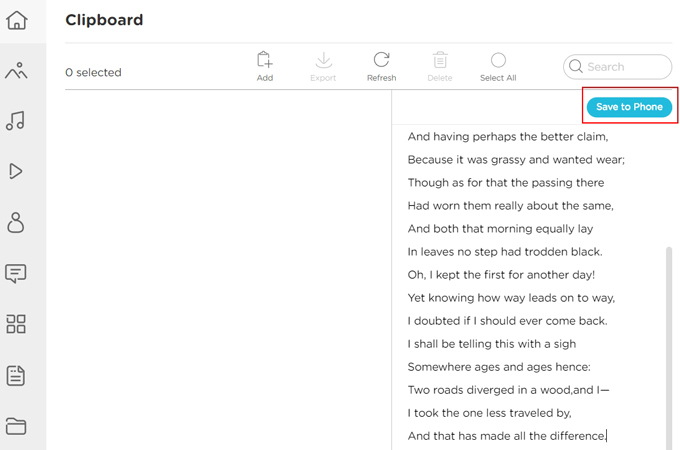 AirMore Clipboard Function Is Available Now! How to Use Clipboard Function? Clipboard plays an important role in our daily life. But it might sometimes be not so practical when we want to copy a paragraph of text from computers and paste to phones, and vice verse. 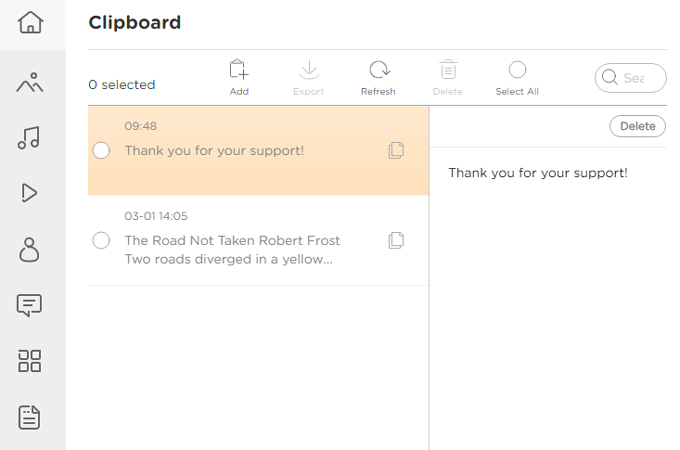 With the constant updates, AirMore has recently been added a clipboard function in order to unshackle users from the traditional complicated way of transferring texts between computers and phones. Below is everything about this all-new feature that you can learn. 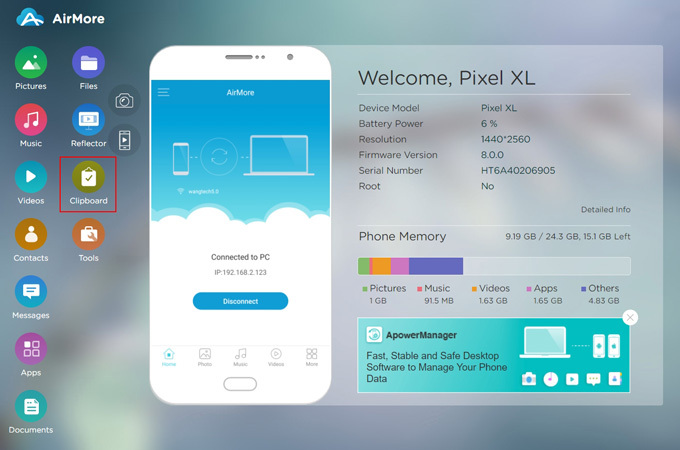 Connect your phone to AirMore Web. Copy your selected content on your phone. On AirMore Web, click the “Clipboard” icon. 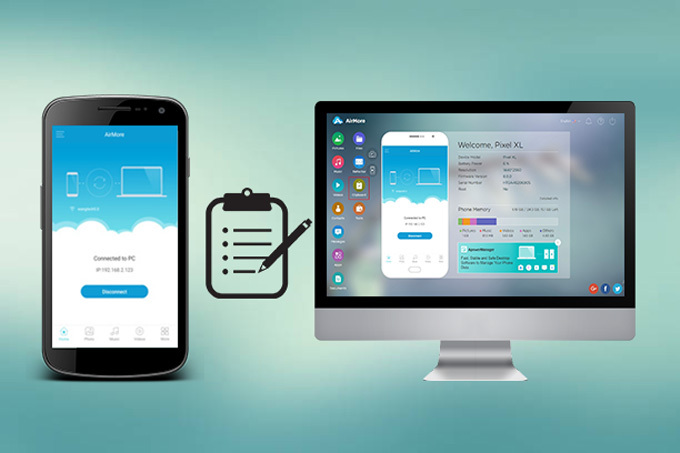 There you can find all the copied contents on your phone and you can use them on your computer. 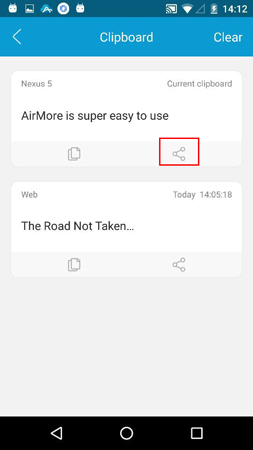 Note: For iOS users, after you have copied the text content on your phone, you need to open AirMore app to sync the data from the app to the web. Then you can click the “Refresh” button and see the copied content on AirMore Web. Click the “Clipboard” icon on the webpage. Click the “Add” button on top. Paste or type in the selected content ready to be transferred. Click the “Save to Phone” button in the upper right corner or click Ctrl+Enter to save them to your phone. 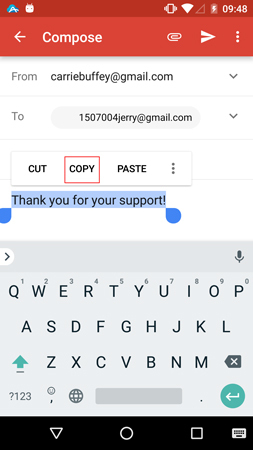 Now you can directly paste them on your phone. 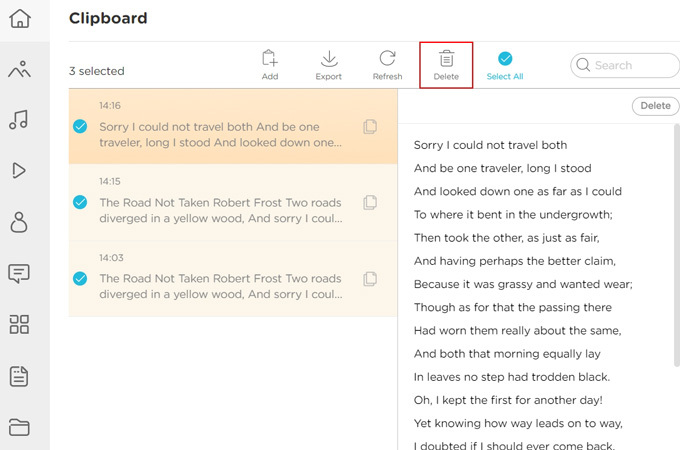 Alternatively, you can open the AirMore app and click “More” > “Clipboard” to find all the content sent from PC. 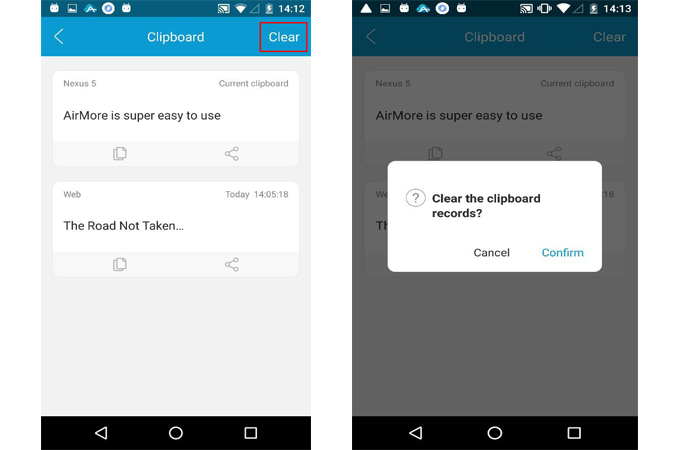 Open the AirMore app and click “More” > “Clipboard” > “Clear” to empty the AirMore clipboard. 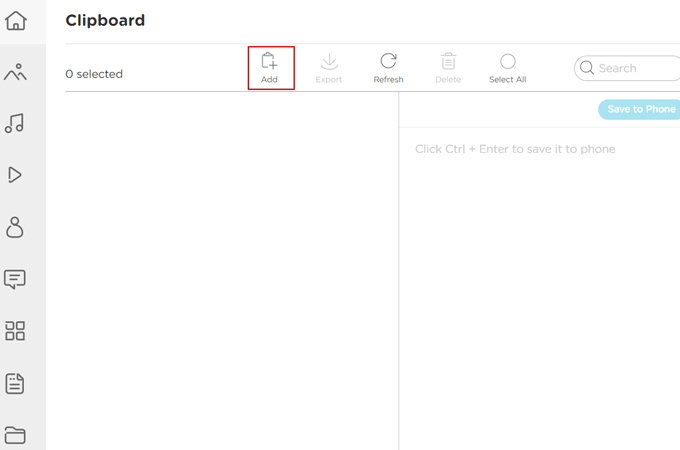 Go to AirMore webpage, click “Clipboard” button, check the text on the left side, and click “Delete” to delete them. 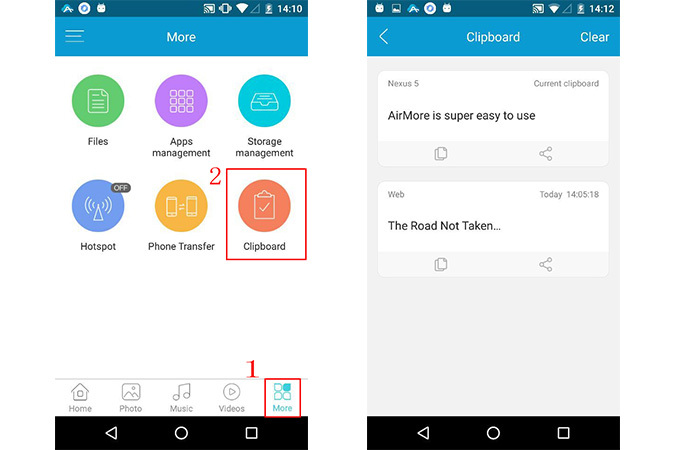 AirMore comes with support for sharing the content on clipboard with your friends. You can just open AirMore app, go to “More” > “Clipboard”, and click the sharing icon under each text. This Clipboard function is supposed to come in handy for everyone. Update your AirMore app now, and you can find this function. If you have any problem, please contact us. We are more than happy to assist you. Rating: 4.2 / 5 (based on 39 ratings) Thanks for your rating!